Unbeknownst to me, 'Red 2' is the sequel to 'Red' which is from a comic of the same name. In this movie, it shows Frank (Willis) trying to live a normal life with his girlfriend Sarah (Mary-Louise Parker) but ends up being boring and safe as he refuses to leave the house for dates etc. In the meanwhile, his best friend Marvin (Malkovich) tries to warn Frank that a top secret document has been released onto the internet stating that both Frank and Marvin were involved in an operation called 'Nightshade' during the Cold War. What ensues is a hilarious action comedy where Frank, Marvin and Sarah try to find out what Operation Nightshade is about while being pursued by CIA, KGB, MI6 and Han (Lee) who was contracted to assassinate Frank. 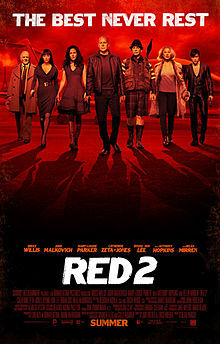 You can definitely watch 'Red 2' without watching the previous installment and still laugh out loud at all the antics. Anthony Hopkins really shined because his acting was perfect. He still has it! Helen Mirren was super cool as contract killer Victoria Winslow and I loved how she and Lee Byung Hun had their own theme song while chasing the baddies/losing their tail in a cool blue Porsche. Malkovich channeled his usual kooky self and was the perfect foil to Willis. 'Red 2' is super entertaining and deserves 5 stars for that laugh out loud factor. Just don't go in trying to make things logical. Some parts definitely don't.